Is it big love you’re thinking of? Say I Love You with this enormously yummy, giant-size fortune cookie. It has been hand-dipped in Belgian white chocolate, then lovingly decorated with pink, white and red heart sprinkles and packaged in its own gigantic take-out carton. Plus, nestled inside the cookie is a personalized fortune – straight from your heart to theirs. Weighs 9.7 oz. Includes a personalized fortune from you! Simply write your message in the ENTER CARD MESSAGE box at check-out. Is it big love you're thinking of? Say I Love You with this enormously yummy, giant-size fortune cookie. It has been hand-dipped in Belgian white chocolate, then lovingly decorated with pink, white and red heart sprinkles and packaged in its own gigantic take-out carton. 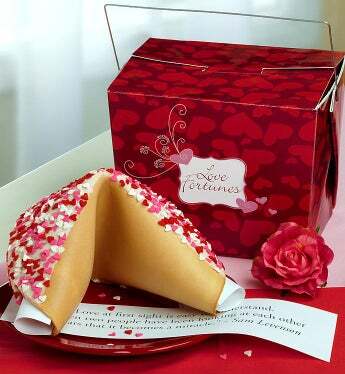 Plus, nestled inside the cookie is a personalized fortune – straight from your heart to theirs. Please note that the personalized message comes from the card message you enter towards the end of the checkout.